SFMTA is accepting feedback and questions. If you have any feel free to contact them. SF OpenData is here. It appears to include a lot more city data. At least some SFMTA Board resolutions are now searchable by referencing particular details, such as project classification, or a specific location. We look forward to additional details such as date of proposed implementation, progress reports and completion date. There were two maps last I looked: One of disable parking spots and one of temporary tow-away zones. The latter seem to out0-numer the former by a large margin. Limiting those temporary two zones could go a long way toward solving the double parking problem. Resolutions appears to be the history of all the detailed little street alterations they take up at engineering hearings. This one starts in 2010. Seems to end at 3/7/17. Hopefully they will get enter the FUTURE actions soon, as those are the ones most people need to know about. This includes video of meetings where supposedly these changes were discussed. Now we meed to how this will work on future projects. Lingering controversy over “tech buses” – shuttles conveying high technology workers here, there, and everywhere – is related to who gets to ride them and how far a would-be passenger has to walk to catch a public or private bus. The free ride and exclusive social element sets the tech buses apart, and causes animosity between tech shuttle riders and everyone else. Muni riders are having their bus stops cut, and seats removed. Shuttles appear to be free, clean and comfortable. They also seem to be closer to a door-to-door service, while Muni is forcing its riders to take longer walks by eliminating stops. It could be an illusion, but it’s certainly a perception. A new privileged class system is rearing its ugly head. The wealth and privilege associated with tech buses adds to feelings of social inequality. Shuttles have become the catalyst for anger that needs an object to lash out against because they’re so visible and appear to be unregulated, ignoring laws and getting away with it. Neighborhoods want to kick the shuttles out. Developers want to eject low rent tenants. Both sides are lining up to protect their turf. Three representatives from the Teamster’s Union declared the program a win-win for all: jobs, profits all around; “labor harmony;” and the streamlining of the shuttle operation, including coordination with residents. One after the other, the commuter buses patrons presented their case: reduction of dependence on cars; ease of travel, with consequent savings to their personal time; the avoidance of 40 minutes on Muni and/or a full CalTrain. Some argued that they ride the commuter bus because there is no shuttle to work from the CalTrain Station. (According to a former Apple employee who helped design its commuter system, that company does pick up at the shuttles.) Almost to a man they parroted the bromide that the program removes 10,000 autos and benefits the environment. Each insisted that they only wanted to live in San Francisco and did not want to own a car. One woman, who rode the buses during the course of two pregnancies, cited the importance of frequent stops. A representative from the Bay Area Council made his contribution. He cited three years working with the MTA and ABAG (the Association of Bay Area Government). He trumpeted the reduction of vehicle mileage, the easing of congestion and the removal of 2 million car trips annually. All this was good for the environment, with the result that the best option is a permanent program. Others asked for increased commuter bus loading zones. During the presentation, Director Ramos asked speakers to indicate if they rode Muni. Some said they had a Clipper Card. (No one indicated they rode Uber/Lyft to the commuter stop, a fact which has been observed.). Surprisingly some commented they would purchase an auto and drive if the commuter bus was not available. (Surprising because many in this age group do not know how to drive and distain the burden of car ownership — one of several reasons for the success of Uber/Lyft). In summary, the “for sustaining commuter bus program arguments were convenience, fewer auto miles, good for the environment, and time savings for personal or family time, i.e., personal benefits. (Not mentioned: the huge tax deduction that the company takes for the business expense of transporting its work force. This deduction reduces their contribution in the form of corporate taxes to the general welfare. (Individuals generally can not deduct their commute, so we all indirectly support this corporate write-off)). One argument against the corporate bus operation is the low mileage-per-gallon in the city vs. the freeway, especially with the extensive use of deadheading. (This argument supports the use of HUBs.) The ignoring of ADA, the omission of an EIR, and the displacement of lower income populations are other frequently raised problems. (More ammunition for a BART HUB.) Also on the legal side, red zone stops violate state code 22500 and cause Muni to fall short of its 85% on-time goal prescribed in the City Charter; and enforced Muni street-boardings violate ADA rules. In view of all the busses’ many violations, the MTA issues too few citations. Noise and vibration impact on houses. Smaller buses could substitute for many if not all of the behemoths. One detractor even contented that if the buses disappeared the 10,000 additional autos represented by the population of riders would have a minor impact on the 300,000 auto commute time total on Highway 101. Finally, buses should benefit all parties (citizens, not select workers). In the end, the support should be for a Public Regional Express Bus system. Presently the program represents an illegal give-away of bus stop space. Prop 26 fee structure should be reviewed, State Assembly Bill 61 to legalize red zone failed. Shift to smaller buses on more streets? Companies determine the size and mix of buses. Director Ramos commented one thousand emails received and New Development in SF funding Mass Transit changes (I assume new market rate development for South Bay workers. However, the Transportation Sustainability Fee derived from new development is deeply discounted to less than 25% of the Nexus Study true transportation expansion cost. Growth is not funding Growth). With a growing economy, MTA must“accommodate the need of Industry.” (Does this mean at all costs and with little or no regard for the collateral damage inflicted upon the neighborhoods?) He applauded the industry for being willing to work with this voluntary program. He conceded that the arrangement was far from perfect and would evolve, including MORE STOPS TO REDUCE DWELL TIME, such as additional loading zones that remove parking. Underlying the argument for the corporate bus operation is a presumption of the inherent right of the individual to enjoy a simultaneous commute-and-work experience, a benefit that suits both the employee and the employer. Of the many individuals who said that, deprived of that right, they would purchase an auto and drive, not one displayed any trepidation about the environmental consequences of that action. I will share the Public Records Request correspondence received supporting the Commuter Bus Program. Mostly repeated cookie cutter statements. Mostly like upstart businesses “mustering the troops” to lobby the legislators. The geography (steep hills) and geometry (narrow /awkward streets) undermine the practical use in this city of motor coaches, i.e., 40’plus vehicles designed primarily for travel on freeways. None of the supporters mentioned any of the intractable and multiple problems associated with them, including staging (idling for a time point departure); the obstruction of intersections; noisy, late night operation; and the conflict with MUNI. Assuming 20% of the future employee expansions of Facebook (6,000) and Apple Spaceship (8,000) will most likely result in additional buses in San Francisco. Plan Bay Area 2040 is up for review. Will the employment centers build work force housing? Work site congestion mitigation transfers congestion to the employees’ neighborhood. San Francisco is not alone, as Private Commuter Buses roam the South Bay Cities traveling from San Jose to Sunnyvale, or Mountain View. The numbers are in. The preliminary 2018 federal budget proposal was released by the Trump administration today, and it doesn’t look good for urban infrastructure funding. 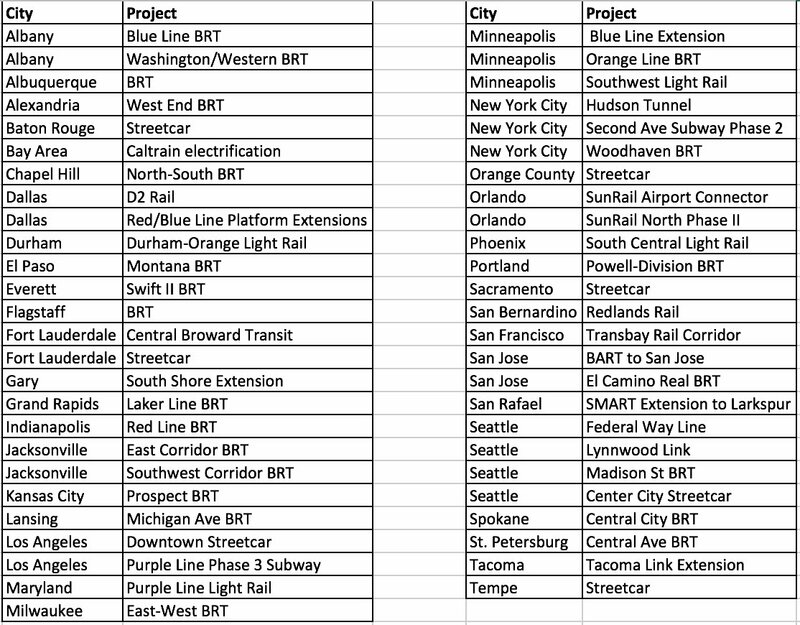 from @yfreemark : List of all transit projects in line for federal funds in the next few years, but which would have their funding cut with Trump budget. A top Obama administration executive at the U.S. Department of Transportation approved a $647-million grant for a California rail project in mid-January and less than two weeks later went to work for a Los Angeles-based contractor involved in the project, The Times has learned. The grant provides a significant part of the money required to install a $2-billion electrical power system on the Bay Area’s Caltrain commuter rail system, allowing the rail to retire its diesel locomotives. The power equipment will eventually be used by the state’s bullet train from Los Angeles to San Francisco, making it a critical part of the $64-billion program. The California High-Speed Rail Authority has pledged about $713 million to help install the system, according to state records. Thirteen days later, Flowers went to work for Aecom, a Los Angeles-based engineering firm. The company news release announcing her hiring says she will head its North American transit practice. Aecom provides program management services to Caltrain for the electrification project, according to Caltrain documents. It was formerly a regional consultant to the high-speed rail project as well. On Friday, the federal transit agency said it had “deferred” a decision on the grant and said it would look at the matter in the next federal budget cycle. The decision may be an early sign of the Trump administration’s view of the bullet train project. The line is already under construction and will need significant federal funding moving forward. The delay follows a letter from every Republican member of the California House delegation to Transportation Secretary Elaine Chao, asking that the grant be put off until an audit of the high-speed rail project is completed. Don’t they call this the revolving door?